Este artículo explora la intertextualidad como una técnica que puede ser usada para tender un puente entre viejos y nuevos programas de alfabetización con los medios dirigidos a profesores y estudiantes que esperan pasar de un modelo de enseñanza basado en los libros de texto a un mundo de recursos on-line, pedagogías flexibles, técnicas de estudio de los medios, construcción interactiva del conocimiento y análisis y producción de multimedia. AAP (2006): Association of American Publishers 2005 Industry Statistics. New York, Association of American Publishers (www.publishers.org/industry/2005_annual_report_preface.pdf). Allen, G. (2000): Intertextuality. London, Routledge. Bromberg, S. (2007): Presentation of the Retour de Flamme at the 2007 San Francisco Silent Film Festival. San Francisco, CA (July 15). Goody, J. (1977): The domestication of the savage mind. Cambridge, Cambridge University Press. Graff, H.J. (1987): The labyrinth of literacy. London, Falmer Press. Jenkins, H. y OTROS (2006): Confronting the challenges of participatory culture: media education for the 21st Century. MacArthur Digital Media and Learning White Paper. Chicago, IL, MacArthur Foundation. (http://digitallearning.macfound.org/site/c.enJLKQNlFiG/b.2108773/apps/nl/content2.asp?content_id=%7BCD911571-0240-4714-A93B-1D0C07C7B6C1%7D¬oc=1) (19-09-07). Kristeva, J. (1980): Desire in language: a semiotic approach to literature and art. New Cork, Columbia University Press. Kristeva, J. (1986): «Word, dialogue and novel», en JARDINE, A.; GORA, T. & ROUDIEZ. L. (Eds. ): The Kristeva Reader. New Cork, Columbia University Press; 34-61. Levin, D. & Arafeh, S. (2002): «The digital disconnect: the widening Gap between Internet savy students and their schools», en American Institutes for Research for the Pew Internet & American Life Project. Washington, DC, Pew Charitable Trust (www.pewinternet.org/PPF/r/67/report_display.asp) (14-08-07). MTV, NICKELODEON, MICROSOFT DIGITAL ADVERTISING SOLUTIONS (Eds.) (2007): Circuits of Cool/Digital Playground. From New Global Study From MTV, Nickelodeon and Microsoft Challenges Assumptions About Relationship Between Kids, Youth & Digital Technology. PRNewsWire (July 24) (http://sev.prnewswire.com/multimedia-online-internet/20070724/NYTU10924072007-1.html) (01-09-07). NEW MEDIA CONSORTIUM AND EDUCAUSE (Ed.) (2006): The Horizon Report. Austin, TX, NMC (www.nmc.org/pdf/2006_Horizon_Report.pdf) (01-09-07). Oblinger, D. & Oblinger, J. (Eds.) (2005): Educating the net generation. Boulder, CO: Educause. Retrieved September 20, 2007 from www.educause.edu/educatingthenetgen. Prensky, M. (2001): «Digital natives, digital immigrants. From on the horizon», en NCB University Press, 9, 5 (www.marcprensky.com/writing/Prensky%20-%20Digital%20Natives,%20Digital%20Immigrants%20-%20Part1.pdf) (01-09-07). 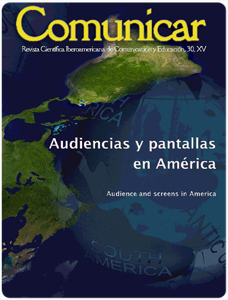 Roberts, D. y OTROS (2005): Generation M: Media in the lives of 8-18 year-olds (March 9). Menlo Park, Kaiser Family Foundation (www.kff.org/entmedia/entmedia030905pkg.cfm) (01-09-07). Scribner, S. & Cole, M. (1981): The Psychology of Literacy. Cambridge, Harvard University Press. Angel Marzal, Miguel; Borges, Jussara;. Evaluative models of Metaliteracy and Information Literacy as factors in academic excellence REVISTA ESPANOLA DE DOCUMENTACION CIENTIFICA , 2017. Area Moreira, Manuel; Ribeiro Pessoa, Maria Teresa;. From Solid to Liquid: New Literacies to the Cultural Changes of Web 2.0 COMUNICAR , 2012. Cortina-Perez, Beatriz; Gallardo-Vigil, Miguel A.; Angeles Jimenez-Jimenez, M.;. Digital illiteracy: a challenge for 21st century teachers CULTURA Y EDUCACION , 2014. Frias-Guzman; Maylin;. Multiliteracy trends in the twenty-first century: Media and Information Literacy (AMI) as integrative proposal PERSPECTIVAS EM CIENCIA DA INFORMACAO , 2015. Izquierdo Magaldi, Belen; Renes Arellano, Paula; Gomez Cash, Olga;. Media literacy in university through multimodal academic literacy workshops EDMETIC , 2013. Izquierdo-Magaldi, Belen; Renes-Arellano, Paula; Gomez-Cash, Olga;. Metacognitive Strategies and Technological Resources used by University Students in Spanish as a Second Language OCNOS-REVISTA DE ESTUDIOS SOBRE LA LECTURA , 2016. Marin Gutierrez, Isidro; Rivera Rogel, Diana; Celly Alvarado, Stephany;. Study on training in audiovisual competence of teachers and students in southern Ecuador CUADERNOS INFO , 2014. Neira Cruz; Xose Antonio;. Literacy media and social integration of the elderly prison population REVISTA LATINA DE COMUNICACION SOCIAL , 2016. Sanchez-Carrero; Jacqueline;. Young Television Viewers/Young Producers How Children Participate as Communicative Citizens PALABRA CLAVE , 2009. Tello Diaz; Lucia;. Transtextuality and metafiction in fake documentaries: self-referential discourse in The Unmaking of COMMUNICATION & SOCIETY-SPAIN , 2014. Area, M., Pessoa, T.. From solid to liquid: New literacies to the cultural changes of web 2.0), Comunicar, 2012. Cortina-Pérez, B., Gallardo-Vigil, M.Á., Jiménez-Jiménez, M.Á., Trujillo-Torres, J.M.. Digital illiteracy: A challenge for 21st century teachers), Cultura y Educacion, 2014. Díaz, L.T.. Transtextuality and metafiction in fake documentaries: Self-Referential discourse in The Unmaking of), Communication and Society, 2014. Frías-Guzmán, M.. Multiliteracy trends in the twenty-first century: Media and information literacy (AMI) as integrative proposal | Tendências da Multi-alfabetização no século XXI: Alfabetização Midiática e Informacional (AMI) como proposta integradora Maylin Frías-Guzmán |), Perspectivas em Ciencia da Informacao, 2015. Gutiérrez, I.M., Rogel, D.R., Alvarado, S.C.. Study on training in audiovisual competence of teachers and students in southern Ecuador | Estudio sobre formación en competencia audiovisual de profesores y estudiantes en el sur de Ecuador), Cuadernos.info, 2014. Izquierdo-Magaldi, B., Renés-Arellano, P., Gómez-Cash, O.. Metacognitive strategies and technological resources used by university students in Spanish as a second language | Estrategias metacognitivas y recursos tecnológicos utilizados por estudiantes universitarios de español como segunda lengua), OCNOS, 2016. Marzal, M., Borges, J.. Modelos evaluativos de Metaliteracy y alfabetización en información como factores de excelencia académica | Evaluative models of Metaliteracy and Information Literacy as factors in academic excellence), Revista Espanola de Documentacion Cientifica, 2017. Neira Cruz, X.A.. Literacy media and social integration of the elderly prison population | Alfabetización mediática e integración social de la población reclusa anciana), Revista Latina de Comunicacion Social, 2016. LAS REDES SOCIALES: USO EN EDUCACIÓN BÁSICA. SOCIAL NETWORKS: USE IN BASIC EDUCATION.